Whenever there is a big repair job needed in a shopping mall, the repair needs to be done with the least amount of disruption and as quickly as possible. Shopping malls are typically very large with a lot of foot traffic. Making sure mall floors are maintained properly is important. So, when a shopping mall is in need of floor repair and leveling, you want the best method to get the job done fast, economically, and effectively. Polyjacking.com has the ideal method to do this. We use a polyurethane foam that is injected through a 5/8” hole and cures in about 15 minutes, so there is little disruption and can be used as soon as the foam is cured. Polyurethane foam is injected through a small 5/8” hole using our specialized system. The foam fills the voids beneath the mall’s concrete floors and expands the concrete back into its original position and is permanently stabilized. After the injection, the holes are filled and the site is cleaned up and there is little disruption to the mall employees and customers. Polyjacking.com has experienced professionals that can handle large projects such as shopping mall floor repair in Kansas City and other locations. 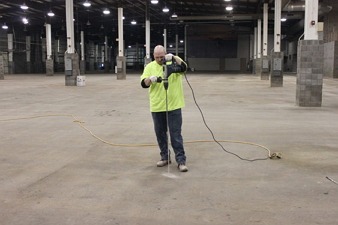 The advantages of using polyurethane foam for shopping mall concrete floor repair in St. Louis and other areas are many. This method is cheaper than having to remove or replace the concrete and requires less equipment than other repair methods, such as mudjacking. It is also more efficient in terms of work time and curing time. The polyurethane hardens in about 15 minutes so the project is done in a very short time. There is no need to close the mall during this concrete floor repair and lifting. Polyurethane foam is not only strong but it is also pliable, making it tough and flexible. The high-density polyurethane foam expands 20 times its liquid volume to fill spaces and take up the shape and size of the voids. This material is lightweight, adding only 3-5 pounds per cubic foot to the mall’s sub-base compared to 100 pounds or more that mudjacking slurry may add. Polyurethane foam is also resistant to moisture so it won’t wash away or erode. Polyjacking.com, a division of Pro Foundation Technology, has the experience and professionals to handle this method of concrete floor repair in St. Louis. Contact us today!